Winmate has launched pluggable digital signage solution OPS (Open Pluggable Specification) that is defined by Intel for one year and keeps expanding OPS solution possibility. Not only basic OPS module, Winmate also has the All-in-One solution combining module with monitor, and OPS box PC. 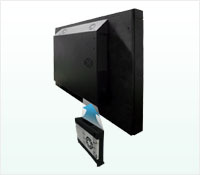 Winmate has announced 3 different CPUs of OPS Digital Signage in 6 different panel sizes. Customer can choose any of the OPS display from 5 sizes (21.5”, 24”, 26'', 32”, 42” and 46”) and insert any one of OPS module (OMIC, OMIS, OMID) to turn into a digital signage. Customer can swap in entry-level, mainstream or high-end modules for the pluggable to satisfy their different needs. OPS Box PC is Winmate another OPS solution that can be applied in industrial market. With OPS structure inside, OPS Box PC can be individually used after adding a mounting I/O box. In addition to original OPS I/O in front, OPS Box PC has expanded more I/O selections in its rear part, like DVI. OPS Box PC has 3 solutions sorted by CPU. If you have any technical questions, footer_contentsample request, or require more product details, please contact your current Winmate Distributor or local Winmate vendor.If you can not reach them, welcome to send enquiry to newsletter@winmate.com.tw and we will help you to find immediate support inshort time.